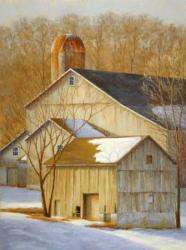 Wyoming artist, Gary Huber, was raised in Pennsylvania Dutch farm country. Gary has always had both feet firmly planted in the great outdoors. His artistic development began at an early age accompanying his mother on Plein Air expeditions into the lush Pennsylvania countryside toting his own box of oil paints. 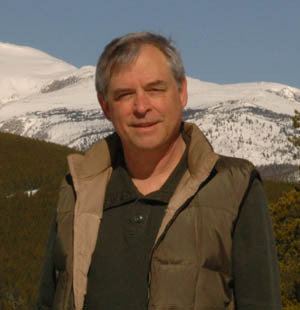 While he was encouraged to keep painting he chose instead to pursue a scientific career that took him to Denver, Colorado. There he spent 25 years, eventually founding a software company devoted to computerized landscape visualization. Feeling pressured by the fast-growing Denver suburbs, Gary moved north to Wyoming where range after range of forested mountains, snow-fed streams and broad, sage-covered plains gave him ample room to roam and inspiration to resume his painting. The outstanding galleries and museums in his adopted state exposed Gary to the rich landscape tradition of the American West. Contemporary painters Clyde Aspevig, Scott Christensen, Lorenzo Chavez, George Carlson and T. Allen Lawson influenced his approach to color and composition. After some experimentation with pastel, a medium that permits lively spontaneity, Gary transitioned to working mostly in that medium. He has since developed a unique style of pastel painting that often is mistaken for oil but whose luminous surface, upon close examination, is found to vibrate with the subtle interplay of woven strokes of color. Gary brings to the easel his own unique sense of composition and light borne from lifelong outdoor study and an early interest in photography. Lately his focus has been on the interaction of light and atmosphere. He imbues his work with depth and mystery inviting the viewer to enter and explore. While Gary took his time coming to fine art as a profession, he has quickly accrued numerous awards and his paintings have found their way into collections across the United States. Recent honors include several Best of Show and First Place awards in national exhibitions, the Buffalo Bill Historical Center Award and placement in the Pastel 100 competition. Gary is a Master Signature Member of the Pastel Society of Colorado, recipient of a Master Circle Medallion from the International Association of Pastel Societies, a signature member of Pastel Society of America, Pastel Society of the West Coast and Northwest Pastel Society, and a member of Rocky Mountain Plein Air Painters and California Art Club. His work has been exhibited at the Butler Institute of American Art, The Haggin Museum, the National Arts Club in New York City and The Brinton Museum, which held a one-man show for him in 2015. More important than awards and praise, Gary seeks to paint according to his own sense of values. Feeling the profound importance of wild natural places and the small farms and ranches that are the cornerstones of America’s independent spirit, these themes are repeated throughout his body of work. Combining naturalistic color with dynamic composition, scenes of peace and tranquility are charged with beauty, spirit and energy. Gary spends his time painting, hiking and traveling the country’s National Parks and wilderness, seeking out-of-the-way places to gather new material and inspiration. He and his wife reside in Buffalo, Wyoming, with a breathtaking view of the Bighorn Mountains.